The International Maple Syrup Institute held their quarterly Board of Directors meeting in conjunction with Annual Meetings of the North American Maple Syrup Council and the International Maple Syrup Institute at the Bavarian Inn in Frankenmuth, Michigan on Sunday October 23rd, 2011. The Board meeting was followed by the IMSI’s Annual Meeting which was held the following day. Attendance was very good at both meetings. The IMSI wishes to thank the Michigan Maple Syrup Producers Association for hosting the NAMSC and Annual meetings and for helping with special arrangements for the IMSI meetings, including accommodating the IMSI business meetings over a two day period. 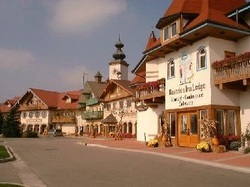 The Annual NAMSC and IMSI meetings were very well organized and the Bavarian Inn provided an excellent venue for the meetings. Congratulations is extended to members of the Michigan Annual meeting planning committee for a job very well done. The IMSI President Richard Norman chaired the IMSI’s Board of Directors meeting and welcomed Directors, advisors and observers to the meeting. The minutes from the IMSI Board of Directors meeting held in Moncton, New Brunswick on August 24th, 2011 were reviewed by the Board and accepted without amendment. Since Steve Selby could not attend the meeting, Gary Gaudette,Past President,IMSI presented the Treasurer’s Report which was accepted without amendment. Further details from the Treasurer’s Report will be included in the minutes from the meeting. Dave Chapeskie presented a proposal developed by the IMSI’s Executive Committee to increase the IMSI’s membership dues for 2012. The purpose of the increase is to enhance funds available to support high priority IMSI project initiatives, including testing for adulteration, nutritional benefits of maple syrup and standardized maple grades . The increase is also required to help support enhanced french translation and transfer of the IMSI’s business reports, some project documents and other information. The proposal to increase the IMSI’s dues the IMSI’s Executive Committee proposal was accepted unanimously by the IMSI’s Board of Directors. It is noted that the IMSI’s membership dues had not been increased since the inauguration of the Institute in 1975. In addition to the membership dues increase, the IMSI will maintain its voluntary project contribution account which was initiated in February 2011 for IMSI members and non-members who wish to contribute further in support of the IMSI’s projects and french translation and information transfer efforts. The IMSI’s proposal for a membership dues increase was supported unanimously by the IMSI’s membership at their Annual meeting. President Richard Norman appointed Gary Gaudette and Jake Couture to IMSI’s Financial Monitoring/Audit Committee and this committee will meet in January 2012 to review IMSI’s financials. Anne-Marie Granger Godbout of the Federation of Maple Syrup Producers provided an excellent presentation focused primarily on the Supply, Markets and Demand for Maple Syrup in Quebec with reference to the bulk syrup trade as part of the IMSI’s Annual meeting in Frankenmuth, Michigan. Audience participation in the discussion was very good. Copies of Anne-Marie’s presentation are available upon request from Dave Chapeskie,IMSI’s Executive Director. Since the IMSI’s Board of Directors unanimously supported the regulatory submission document which incorporates the IMSI’s proposal for standardized grades, the regulatory submission has been forwarded to appropriate maple regulatory authorities at the federal (USDA, CFIA) and state/provincial level with a request to incorporate the proposed changes into regulation as soon as possible. . A maple industry/government address listing with federal and state/provincial liaison contacts has been developed to facilitate communications with regulatory authorities.The IMSI’s goal for implementation remains as the 2013 maple production season. However, the Institute with the help state/provincial maple industry liaison designates will be monitoring progress in the various regulatory departments closely, and will determine if any adjustment to that timeline is required to ensure a smooth transition to the new standardized grading system. The IMSI members and others are strongly encouraged to send letters of support for the changes to appropriate government officials at the federal and state/provincial level ,since this action should help expedite the changes. The approved implementation plan for standardized grades called for the design and implementation of operational market trials or stated another way ,market exposure of the new maple grading and nomenclature system in an operational environment prior to implementation. The main purpose of these trials is to have a limited number of producers / packers in the United States and Canada work with the new standard maple grading system in advance of full implementation, to provide both producer/packer and consumer feedback which will assist the IMSI and producers/packers upon implementation of the changes. For example, this operational engagement with the new maple grading standard will help the IMSI further refine communications materials accompanying the change and help maple syrup industry stakeholders including male producers, packers and others adapt to the change. Currently, an operational market trial or market exposure of the new grading system is underway in Ontario and others are under discussion. The number of operational market exposures will be limited and somewhat varied in format ranging from awareness/educational exhibits to adoption of the new grading system by a limited number of maple producers/packers for the 2012 maple production season. The IMSI is continuing to raise awareness in the North American Maple community regarding the standard grades and nomenclature. IMSI members and advisors are encouraged to assist with this awareness activity and should contact Dave Chapeskie, if they require any related assistance or awareness materials. Dave Chapeskie delivered a Powerpoint presentation on the IMSI’s Standardized Grades proposal in the main NAMSC/IMSI meeting forum. Ray Bonenberg reported some early operational market trial findings from Ontario. Dave Chapeskie , Henry Marckres and Yvon Poitras(french language) are the primary contacts people to address specific questions regarding the standard grades initiative and the supporting regulatory submission. Both NAMSC and IMSI are very concerned about Pinnacle Food’s use of a container that is very similar to the Sugar Hill Jug for the marketing and sale of a table syrup under the brand name of «Log Cabin - All Natural Table Syrup». The IMSI has taken the lead on this issue and Dave Chapeskie and Mike Girard, Executive Director of NAMSC have been working together through our respective Executive Committees regarding content of written communication to Pinnacle Foods. In addition, we have had the advice of an attorney who oversees the content of the letters we have sent to Pinnacle Foods. We believe that Pinnacle Food’s use of a traditional pure maple syrup jug creates confusion and misleads the consumer who could easily mistake the Log Cabin product for pure maple syrup, due to the characteristics of the jug. The Log Cabin jug has the same unique shape, color and graphics of our traditional container which has an established and longstanding identification to pure maple syrup. We believe that the use of this “trade dress” by Pinnacle creates confusion to consumers. Both the NAMSC and the IMSI are also concerned about shelf-placement of table or blended syrup with pure maple syrup in retail outlets. Our concern is that blended maple syrup is often integrated or grouped with pure maple syrups in product displays in retail stores. Containers used and product labels can be misleading to consumers. The NAMSC and the IMSI have jointly sent several letters to Pinnacle Foods expressing their concerns which remain unaddressed. The two organizations also sent a letter to major food retailers in Canada and the United States alerting them to the concern regarding shelf placement of maple syrup and table syrups, particularly in circumstances where container type and labeling of table syrups may lead some consumers to believe that these products are maple syrup. Based on early feedback,some retailers are expected to review related policies regarding shelf placement. Ray Bonenberg, Chair of the IMSI’s Nutritional and Health Benefits Committee reported about the ongoing nutritional and health benefits. Since the last IMSI Board meeting in Moncton, New Brunswick. Ray and Dave Chapeskie met with officials of Health Canada to discuss the draft poster and rack card information resources which have been developed. The IMSI also received feedback from an official with the US Food and Drug Administration regarding the materials and their use by the IMSI and members. The IMSI was cautioned by government health department officials regarding the use of preliminary research findings to relate potential health benefits since there are restrictions on what can be said, particularly in marketing applications. Ray is working with committee members to finalize the poster and rack card files which should be completed before the end of the calendar year. Once the poster and rackcard are finalized,the IMSI will be publishing a CD with the IMSI Position Statement on Nutrition and Health Benefits of Maple Syrup, scientific references, some website references as well as the poster and rack card files. All IMSI members will be provided with a copy of the CD. IMSI members interested in a bulk purchase of the CD’s should advise Dave Chapeskie as soon as possible. The CD cost is expected to be about $1.50- $2.50 per CD, depending on the size of the order. Henry Marckres advised the IMSI’s Executive Director that the US Food and Drug Administration has filed charges in federal court for a case of syrup adulteration which was identified through the IMSI’s adulteration testing program. If there is a conviction in this instance, the fine could be as high as $10,000. At the same time, Senators in Vermont and New York State have proposed that adulteration of syrup be a felony in the United States. It is also proposed that label requirements be stiffened to avoid misrepresentation of table syrups in the marketplace. Further information can be obtained from Dave Chapeskie. Dr. Luc Lagace of Centre Acer provided a progress report regarding the development of additional adulteration product evaluation tools as part of the NAMSC technical meeting forum. While this development has not yet been completed, results are very encouraging. It is anticipated that new and very effective tools for detection of adulteration and off-flavoured syrups will be available in the foreseeable future. Initially, it is possible that these tools may be accessible to maple regulators and ultimately to maple industry stakeholders. Eric Prud’Homme, Interim Chair of the IMSI’s Organic Certification Committee updated the Board regarding a plan to re-activate the committee. Work activities will include documentation of the current scale and status of Organic Certification of Maple Syrup in both Canada and the United States, and exploration of interest in and the merits of harmonizing organic certification standards at the federal level in Canada and the United States. The committee may also review concerns regarding marketing organically certified maple syrup in relation to non-certified pure maple syrup.An IMSI organic certification committee has been re-established and the IMSI is seeking a new chair for the committee. Further information can be obtained from Dave Chapeskie upon request. The IMSI currently sponsors two awards annually, the Golden Maple Leaf Award which recognizes innovation in the North American and International Maple Syrup Industry and the Lynn Reynolds Memorial Leadership Award which recognizes outstanding service and accomplishments of an individual for the North American/International Maple Syrup Industry. The 2011 award winners were announced at the Banquet event of the Annual North American Maple Syrup Council/International Maple Syrup Institute in Frankenmuth, Michigan. IMSI President Richard Norman presented the awards. Citadelle Cooperative was the recipient of the Golden Maple Leaf Award in the specialized area of product development and marketing and was recognized for the development and launch of a new line of personal care maple products. The recipients of a second Golden Maple Leaf Award were Kathy Hopkins, University of Maine-Cooperative Extension, Henry Marckres, Vermont Agency of Agriculture, Food and Markets and Sumner Dole, University of New Hampshire Cooperative Extension(Retired) for the developing and successfully delivering the very popular IMSI sponsored Maple Production Grading School . Avard Bentley of Weschester Station, Nova Scotia was the recipient of the 2011 IMSI Lynn Reynolds Memorial Leadership Award. Avard is well known in the North American Maple Syrup Industry. He has been recognized recently for his contributions in his home province of Nova Scotia, has been a delegate to the North American Maple Syrup Council since 1986 and currently serves as a Director of the IMSI. IMSI members may learn about the IMSI’s sponsored Maple Grading School and its offerings by accessing the University of Maine –Cooperate Extension website with the link provided below. The IMSI’s Nominations Committee Report for 2012 was presented by Gary Gaudette, Chair of the IMSI’s Nominating Committee. The Report outlined the proposed IMSI Board of Directors and Advisors for 2012. This report was accepted without amendment by both the IMSI Board of Directors and IMSI Members at the subsequent Annual Meeting. Steve Childs of Cornell University was assigned as advisor to the IMSI. The Nominating Committee’s recommendation for elected IMSI Executive Committee members for 2012 was accepted at both the IMSI’s Board of Directors and Annual Meeting unanimously and without amendment. Elected members of the IMSI’s Executive Committee for 2012 are Richard Norman,President,Yvon Poitras,Vice President,Steve Selby ,Treasurer and Gary Gaudette,Past President.The IMSI President Richard Norman appointed Dave Chapeskie as Executive Director for 2012 and Dave will serve as a member of the IMSI’s Executive Committee. The next IMSI Board of Directors meeting will be held in Burlington, Vermont on Friday February 3rd, 2012. Please contact Dave Chapeskie, Executive Director, IMSI if you require additional information.